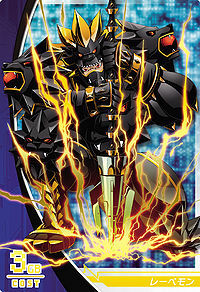 A Digimon that truly inherited the "Spirit of Darkness" of the legendary Ten Warriors. The "Spirit of Darkness" was changed into its Duskmon form due to Cherubimon's spell, but Löwemon is its true form released from this magical power. 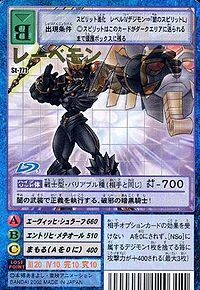 This form is by no means a baleful one, and is called the battling "Valiant Jet-black Warrior" that becomes the shadow of the other Ten Warriors. Even on its own, its power is comparable to "Fusion-species" like Aldamon, and it is said that it conceals its power that puts the others to shame within the "Neebelnge Ring" placed on its right index finger. As a master of spearmanship, it is an "Executor of Darkness" that pierces evil with the "Danzai no Yari", and purifies it with the "Shokuzai no Tate". 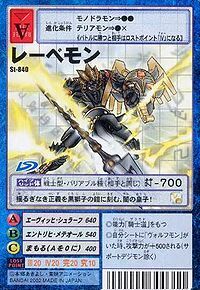 Its Special Moves are blasting the opponent with an intense spear attack (Ewig Schlaf), and firing a golden energy wave from the lion on its chest (Endlich Meteor). Title: 「闇の人闘士」 — "Human Warrior of Darkness"
「勇敢なる漆黒の闘士」 — "Valiant Jet-black Warrior"
「闇の執行人」 — "Executor of Darkness"
n., Löwe 「レーベ Rēbe」 means "lion". Lowee is a corruption of Löwe. Loewe is a corruption of Löwe. 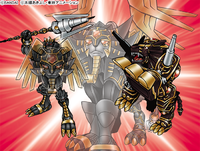 Anime/Manga Digimon Frontier: "The New Warriors of Darkness! 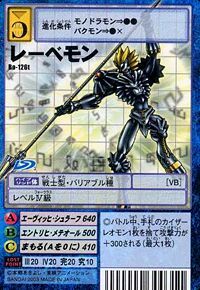 Löwemon & Kaiser Leomon"
Ewig Schlaf  Eternal Sleep エーヴィッヒ・シュラーフ Ēvihhi Shurāfu Shadow Lance Blasts the enemy with a powerful spear attack. 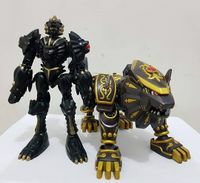 Endlich Meteor  Final Meteor エントリヒ・メテオール Entorihi Meteōru Shadow Meteor Launches a wave of golden energy from its chest. Stabs the enemy with its spear. A rapid triple thrust with its spear. Uses Endlich Meteor in midair. Kicks off the ground with its spear while dashing to kick the opponent. Transforms into a dark aura that wraps about the enemy. 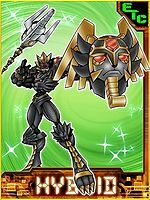 A more powerful, charged-up version of Endlich Meteor. An aerial version of Intensiv Endlich Meteor. 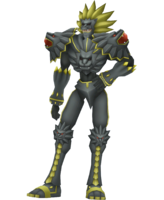 Löwemon is the form that Kouichi takes when he evolves with the purified Human Spirit of Darkness as opposed to his previous hybrid form of Duskmon. Löwemon is only obtainable as a collectible card. 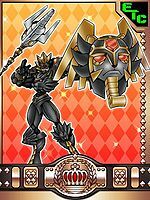 Löwemon is available as a Digimon Medal. Enforcing justice while clad in armaments of darkness, an evil-destroying dark knight! 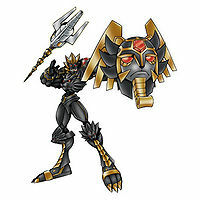 The prince of darkness, its unfaltering sense of justice is engraved into its black lion armor! An evolution achieved with the Human Spirit that holds the power of the Warrior Ten of Darkness. 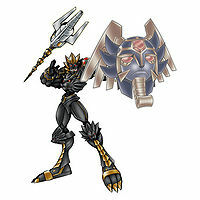 After being released from Cherubimon's curse, it acts as the shadow of the Five Warriors of Justice. It wields the Spear of Judgement and the Shield of Atonement. 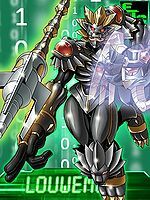 ↑ 11.0 11.1 Digimon Frontier: "The New Warriors of Darkness! Löwemon & Kaiser Leomon"
↑ Digimon Frontier Special Drama CD: "A Train Named Hope"
↑ Digimon Frontier: "Fly Towards Victory! Confrontation at Cherubimon's Castle"
This page was last modified on 9 April 2019, at 06:13.